When it comes to craft beer, one drink may be more than you think. You’ve probably heard it said that a shot, a glass of wine and a beer all contain the same amount of alcohol. That used to be (mostly) true, but then the craft beer market exploded. These days, your beer could have an alcohol content of anywhere from 2 to 20 percent—or even higher. Before we get into that, let’s take a look at the alcohol content of some typical drinks. In the United States, a standard serving of alcohol is considered to be 14 grams. When it comes to wine, which is usually about 12 percent alcohol, that’s roughly the equivalent of five ounces. Although the alcohol content of wine doesn’t vary as much as beer, there are definitely differences. A California white zinfandel, for example, is usually about 12 percent alcohol, while a port could come in as high as 20 percent. That’s why a serving of port is usually only about three ounces. If you were to drink a “standard” five ounces of port, you’d actually be consuming 1.7 drinks. Most types of liquor have an alcohol percentage of around 40 percent, which means that a standard serving is 1.5 ounces. Unlike beer and wine, there’s not a whole lot of variation. While a Bud Light comes in at 4.2 percent alcohol, craft beer usually has a much higher percentage. The strongest beer in the world is the Scottish Brewmeister Armageddon, which has an astonishing alcohol percentage of 65 percent. Most craft beers don’t contain anywhere near that much alcohol, but they almost always have more than the average domestic beer. The consumer research group Mintel found that the average alcohol content of craft beer is 5.9 percent. But there are many heavyweight or extreme beers that can have as much alcohol as 20 percent. If you’re drinking a 17.5 percent Samuel Adams Triple Bock, a 12–ounce serving clocks in at way more than 14 grams of alcohol. So while you may think you’re drinking one beer, you’re actually drinking the equivalent of 3.5 drinks. If that’s all getting a little confusing and you’d rather not do the math, the National Institutes of Health provides this drink size calculator. Knowing exactly how much you’re drinking, after all, is the first step in staying in control of your alcohol consumption. If you can’t control your drinking, then it may be time to seek help. 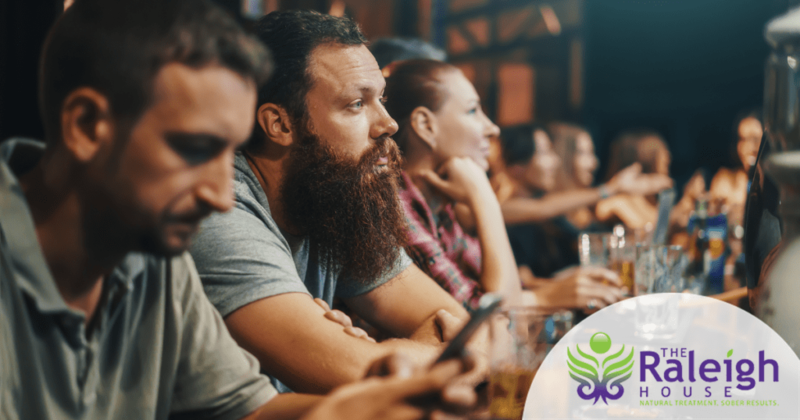 Over time, alcohol can change the brain, making it difficult, if not impossible, for some people to stop drinking without help. At The Raleigh House, we take a whole-person approach to recovery. That means we don’t just get the alcohol out of your system. We work with you to help you recover psychologically, mentally, spiritually and socially, as well. Rehab isn’t just about giving something up; it’s about getting your life back. Fill out our form or contact us today to learn more about the alcohol addiction treatment program at The Raleigh House.